I'm not one to get involved with such club rivalry but I did think he had a point. Palace have changed their entire strip and colour scheme several times in the past 50 years with some, such as the Charlton fan mentioned earlier, considering this a hindrance... or at the least an identity crisis. 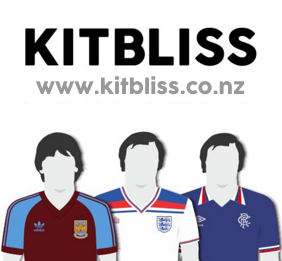 One benefit of this colour indecision is that there has been a rich variety of different Palace kits over the years. Fans under 20 probably only know the club in red and blue stripes. Chaps of my age (40+) still have it in our heads that they play in white with a red and blue sash but if you’re any older, then its various combinations of claret and light blue that you will most associate with the Eagles - or as they were nicknamed in those days, The Glaziers. 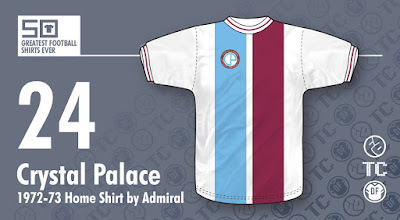 The Palace kit that makes our countdown actually hails from the latter days of claret and light blue just prior to then boss Malcolm Allison’s complete rebranding of the club and the colour switch to red and blue. 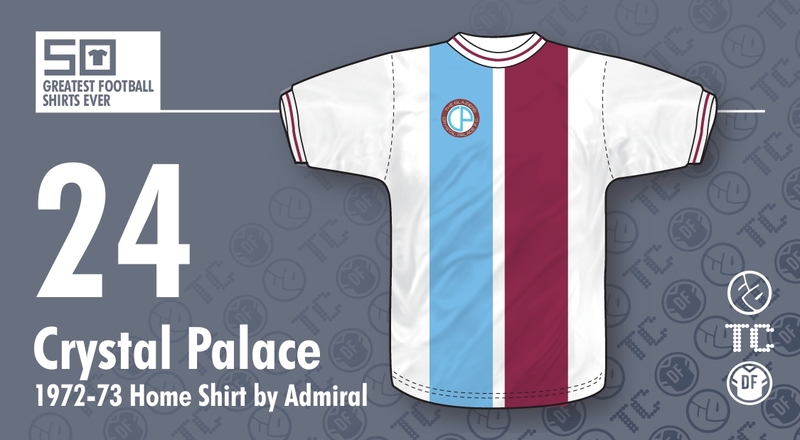 After five years of either light blue with claret stripes or claret with light blue stripes in 1971, the club switched to a predominantly white kit with a claret and light blue vertical panel running down the centre, crafted of course in the style of the day, namely a long-sleeved crew neck shirt. A year later the design was refined to the one you see here, with the addition of a narrow white stripe separating the two colours and the addition of a new round modern badge. It’s such a simple but strong and effective design, it's a mystery that, save for a few examples of the era (e.g. 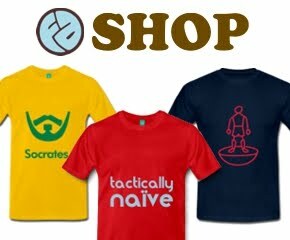 Chelsea away) this particular style of kit was not adopted by other clubs. In fact in many respects the dual vertical stripe approach could be seen as the forerunner of the ground-breaking sash design that appeared on the Manchester City change kits the following season, and of course famously at Palace a few years later. So whether you consider the club to sport claret and blue, red and blue or a be-sashed white, this particular strip deserves recognition as the one that bridged the gap between them all. Whilst a memorable kit, it wasn't the forerunner of the Manchester City sash design first seen (to the best of my knowledge) in 1971/72. The kits worn by Inter Milan and Cagliari in the 1960s are a far likelier inspiration, given Malcolm Allison's predilection for all things continental. Sounds logical, Peter - thank you! Wouldn't this have been Admiral's first kit? I had no idea they were making kits a year before the L**ds deal. 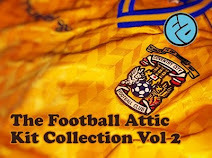 The restrictions on wearing manufacturers' logos on outfield kits would have been lifted by 72-73 (L**ds wore the Double Diamond on their shorts as early as February 72 and became the first team to wear a manufacturers' logo in the FA Cup in May) and I could have thought Admiral would have taken advantage of it off the bat. Does seem pretty "Admiral" regardless. I think you're right, Anonymous. I was quite surprised to find out this was actually an Admiral shirt, but there are images online that show the Admiral tag inside it, and the previous one without the white stripe down the middle. I have a very early replica of this - admiral I think - but it is the version without the white centre between the claret and blue.